Anchovies and cauliflower are a sublime pairing, and this fabulous combination makes cauliflower the star of the meal. While Russ adores anchovies in their whole form, I can’t get past the little hairy critters, but I love the taste of them when finely chopped up and mixed into a recipe. Originally, six whole filets seemed a bit much, but in the end, we got a delicious suggestion of anchovy, not an overpowering punch. This is one of those dishes that improves greatly if allowed to sit for several hours before eating. Serve at room temperature or warm it gently on the stove or in the oven. Trim the leaves and stem from the cauliflower head. Working from the bottom of the head, cut off individual florets until you reach the crown, where the florets are small and fused together. Cut the large florets into quarters, the medium ones into halves, and the crown into four pieces, always trying to keep the top of the florets attached to pieces of stem. In a mortar, crush the garlic and the salt with a pestle until you obtain a paste. Add the anchovies and pound them to a paste as well. (If you don’t have a mortar, you can mince the garlic, salt, and anchovies very finely and then mash them with the flat side of the knife until they become a paste.) 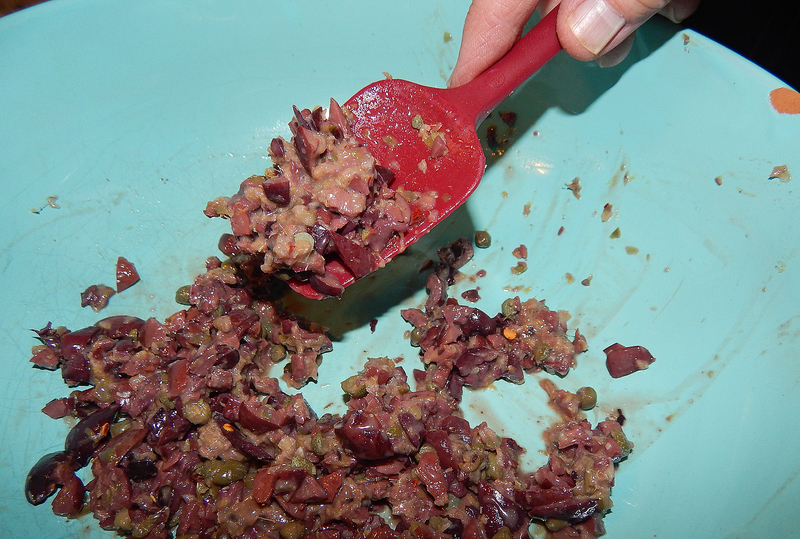 Scrape this mixture into a large shallow bowl. Add 1 Tbs. of the oil, the olives, lemon juice, capers, lemon zest, and red pepper flakes. Stir well. Heat 2 Tbs. of the olive oil in a heavy 10-inch skillet over medium-high heat. 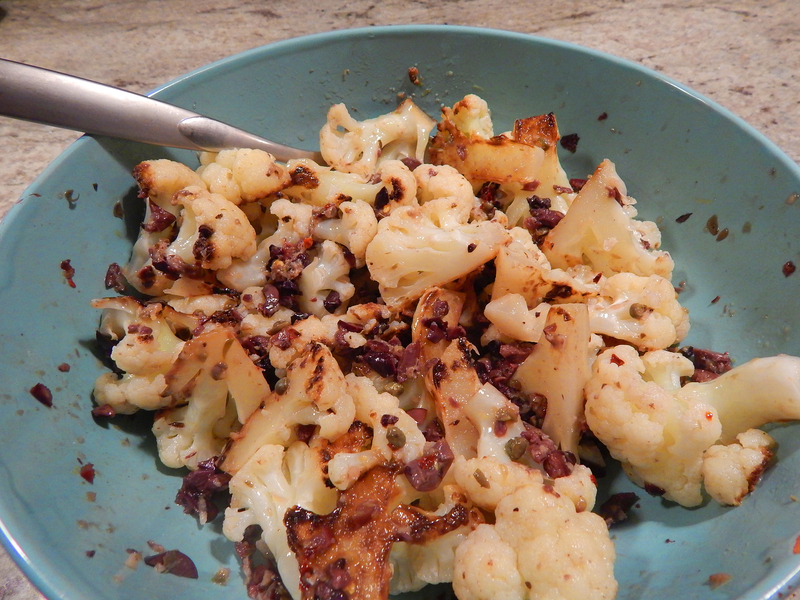 When the oil is hot, add half the cauliflower pieces in a single layer, flat side down. 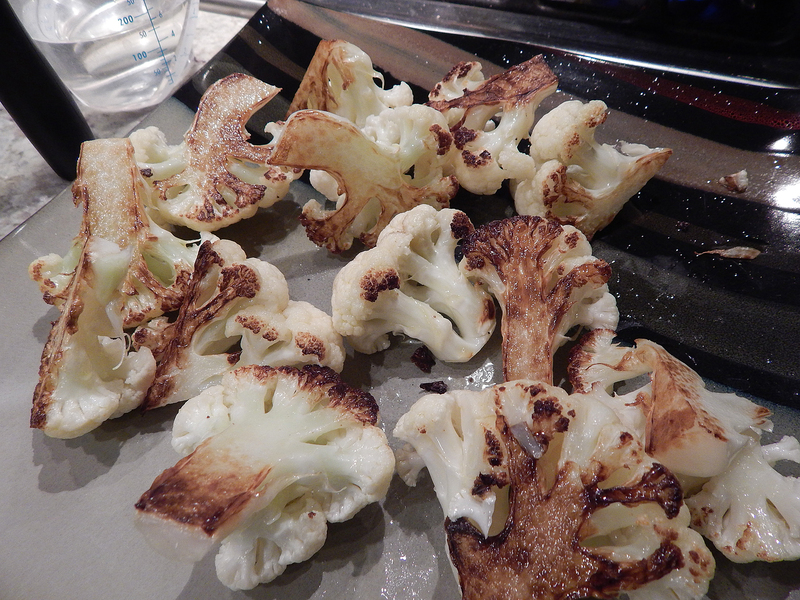 Cook the cauliflower until well browned on the bottom, 2 to 4 minutes, and then transfer to a plate. Add the remaining 1 Tbs. oil to the pan and repeat with the remaining cauliflower, but don’t transfer it to the plate. Return the first batch of cauliflower to the pan, turn the heat down to low and carefully add 2/3 cup water. Cover and let steam until the stems are just tender, 6 to 8 minutes. With a slotted spoon, transfer the cooked cauliflower to the bowl with the anchovy mixture. Add 1 Tbs. of the cooking liquid. Let sit 1 minute to warm and loosen the mixture, and then turn gently to coat the cauliflower and evenly distribute the olives and capers. Serve warm or at room temperature.